Which two sporting events would you say draw the most betting interest in your circle of family and friends? Gotta be the Super Bowl and March Madness, right? If you don’t enter some kind of Super Bowl squares pool or at least bet five bucks on the game with a buddy, the Un-American Activities Committee will hunt you down. If you don’t wager a couple bucks on the office bracket pool and you’re caught, pretty sure you automatically get deported. I haven’t done either since college. As much as betting on sports (or Jersey Shore hookups, Mad Men plot twists, and loosely related sporting themes such as The Baseball Wives) can be a great way to liven up the proceedings, if I’m not in Vegas, I rarely bet on anything. Even my fantasy leagues are played at either low stakes or no stakes. But a few years ago, a friend introduced me to the magical world of baseball over/unders. All I knew about baseball betting at the time was that teams were given certain odds of winning the pennant and/or the World Series. Always seemed like a sucker bet. The heavy favorites and fan favorites (often the same team, often the Yankees), would be given extremely unattractive odds to win. You could also put a C-note on a gigantic long shot, fantasize what you’d do with a hundred grand if your miracle bet paid off, and never see that picture of Ben Franklin again. Over/unders were different. This was close to a straight-up bet, minus the vig the sports book or online gaming sites would usually take; if you looked hard enough, you could get even odds or positive odds on a bet. In essence, all that mattered was your ability to outsmart the line maker and, in a way, the general public. Casinos, like online betting sites, will set lines to attract maximum betting action. They’re playing on everything from player and team reputations to the splashiness of offseason moves to the popularity of certain teams (often the Yankees and Red Sox, though Los Angeles-area teams seem to get weird betting lines often, possibly due to the ease with which you can hop over to Vegas from L.A.). For any baseball fan who thinks batting average was a quaint idea that stopped being useful 30 years ago, it’s a golden opportunity to put your money where your stat-stuffed mouth is. One of the most popular advances in the sabermetric community over the past decade has been the proliferation of projection systems. Baseball Prospectus’s PECOTA, Dan Szymborski’s ZiPS, Bill James’s brand of projections, as well as CAIRO, Oliver, Marcel, and the no longer publicly available CHONE all crunched players’ past results, combined those stats with age, injury data, and in some cases scouting information, and spit out forecasts for every player. (For more on how these systems work, see this writeup by FanGraphs’ Steve Slowinski.) By combining all those player results on each team then adjusting for strength of schedule, you could build standings projections for all 30 teams. By combining those team win predictions with your own additional analysis, you could find and exploit inefficient betting lines, and make money off them. One of my favorite methods for narrowing down best bets every year is to compare the prevailing over/under lines against the various projection systems, then look for gaps of five games or more. That big a gap in itself isn’t necessarily enough to warrant a bet. But it should at least prompt you to investigate further, to see why the sharps think one thing, the statheads another. let’s say more than a few pounds lighter. Let’s check in on how that’s working out. Make all the arguments you want about bad hops, unlucky breaks, and small sample sizes. Now please provide a list of other third basemen who’ve fielded grounders with their face. The Fielder-Raburn-Peralta-Cabrera alignment could end up ranking among the worst infields baseball has seen in decades. That’s bad news for a Tigers pitching staff that had just about everything go right for them last year. Justin Verlander is a great pitcher — who’s also an extreme long shot to ever match 2011’s numbers. Doug Fister showed real improvement in his command (57/5 K:BB rate with the Tigers) — and also benefited from a cupcake schedule in the final two months of the season. Jose Valverde walked too many batters, as he’s done for most of his career — and somehow managed 49 saves in 49 attempts. through the hole and into left field. Two runs score, and Jim Leyland’s forced to go to his bullpen early. It’s not hard to imagine that scenario playing out multiple times this season, forcing middle relievers to win games and placing extra strain on a bullpen that could hurt their effectiveness, even up their workload enough to raise injury risk. The Tigers are going to hit the snot out of the ball. They’re heavy favorites to win the AL Central (despite the Indians having a bit of a sleeper’s sheen). But unless you own Fielder and Cabrera in your fantasy league, the Tigers will also win fewer games than their big names and big payroll might suggest. If you wanted to short any team in baseball, Detroit’s the one to go after. It’s a simple narrative: The longer the ownership mess hangs over the Dodgers, the longer it’ll take for them to reemerge as viable contenders. and the 1899 Cleveland Spiders. Here’s the thing about spending in baseball, though: Unless you’re the Yankees, the formula usually goes success first, spending second. Develop top talent internally, become a contender, then worry about re-signing your top guys before they hit free agency, and signing premium free agents to big deals. Other than the killer combination of Matt Kemp and Clayton Kershaw, the Dodgers have struggled to develop elite talent through their own minor league system. The third-best homegrown guy on the major league roster is probably Dee Gordon, a lightning-fast shortstop with promising defensive skills who also can’t tell balls from strikes and hits homers about as often as Frank McCourt gets love letters from Dodgers fans. Still, you can be an above-.500 team with two superstars and a cast of decent role players. The problem is general manager Ned Colletti hasn’t shown he can find competent role players at bargain prices, the way so many smaller-budget teams have. Colletti scanned the free-agent landscape and decided that the best bet to play left field was Juan Rivera, a mediocre hitter (.314 and .308 wOBAs in 2010 and 2011) who’s generated just over 1 Win Above Replacement over the past two seasons, wasting about 1,000 plate appearances to get there. At least Rivera’s only going to eat $4 million and a club option to play poorly and block Jerry Sands (a rare homegrown player with some pop) from playing time. Juan Uribe had a career year at age 32 with the 2010 Giants, convincing Colletti that a career stuffed with injury problems and a complete misunderstanding of the strike zone wasn’t as important as whatever happened 10 minutes ago. Uribe’s now in year two of a three-year, $21 million deal, slated to be the Dodgers’ starting third baseman this year after hitting .204 with four homers in the 77 games he didn’t miss in 2011. On the plus side, 2012 could bring the Dodgers another Cy Young, an MVP award, and the league lead for crummy, overpaid starters named Juan. bet they’re closer to that number than 81.5. Make up all the post-hoc fried chicken and beer excuses you want for the 2011 Red Sox. You know why they suffered the biggest September collapse in Major League Baseball history? Because their starting pitching fallback plan consisted of Tim Wakefield, Andrew Miller, and Kyle Weiland. Let me be the 7,812th person to tell you that starting pitching depth is crucial for teams with playoff aspirations. No matter how shiny your rotation looks on Opening Day, it will probably look substantially different by Memorial Day, much less Labor Day. Some of the teams with the most bullish projections this year — including the Yankees, Rangers, and Rays — owe a lot of that optimism to very good, very deep starting pitching talent. Given the 85.5 number (with +115 odds no less), the Cardinals aren’t being viewed in that light. Some of this makes sense. Albert Pujols has been so dominant in his 11 seasons that even if he retired tomorrow, he’d be a no-doubt Hall of Famer; the Cardinals lost him to the Angels. Chris Carpenter chucked 273 innings in 2011 between the regular season and playoffs, including one of the best pitching performances in franchise history in the deciding game of the NLDS, against Roy Halladay and the mighty Phillies; the Cardinals have lost him indefinitely to a nerve injury. Adam Wainwright won 39 games with a combined 2.53 ERA over the 2009 and 2010 seasons, second only to CC Sabathia (40 wins) and Felix Hernandez (2.38 ERA); the Cardinals lost him to Tommy John surgery all last season, and there’s no telling how he’ll pitch this year, especially in the early going. Here’s the thing: Even without Pujols, even if Carpenter misses months and not weeks, even if Wainwright takes a while to return to form, the Cardinals are a good team with a legitimate chance to win the NL Central. For that they can thank their starting pitching depth. 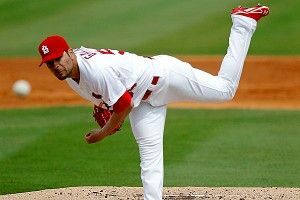 Jaime Garcia has quietly developed into one of the top lefty starters in the game, ranking 13th among all SPs over the past two seasons with a 3.31 FIP. Kyle Lohse looks weird as an Opening Day starter, but he parlayed elite control (two walks per nine innings) into a solid 2011 campaign (3.67 FIP, 2.5 WAR). Lance Lynn struggled in his most recent spring training start, but has otherwise looked promising as the Cardinals stretch him out from success 2011 reliever to viable 2012 starter. If Carpenter’s injury lingers longer than expected or veteran Jake Westbrook can’t pitch well enough, the Cards have an ace in the hole in Shelby Miller, one of the top pitching prospects in all of baseball who’s expected to be ready for the show any day now. One-time starter Marc Rzepczynski also lingers in the pen, should the Cards decide to try an in-season conversion. With all those arms, plus GM John Mozeliak showing he’s able and willing to make big deals at the deadline, St. Louis should contend again this year. And all that’s before we get to the rest of the roster. A healthy Carlos Beltran (.389 wOBA) would give the Cardinals a big chunk of what they missed in Pujols. Power-hitting infielder/outfielder/National League DH Allen Craig should finally get a shot at more regular playing time, and reports now have him possibly being ready to return to action by Opening Day (or soon thereafter). You don’t want to overestimate the importance of a couple dozen games, but it’s not hard to imagine a career-best season for playoff megahero David Freese if he too can shake the injury bug. Meanwhile, the Opening Day bullpen goes from Ryan Franklin and Miguel Batista holding down the late innings to 99 mph fastball wielder Jason Motte and a deep stable of great, young arms doing the job. It’s certainly possible that the Cardinals fail to win the 86 games needed to win this bet: Since 1975, World Series winners have declined by an average of 7.6 wins the following year, and the Cardinals won 90 in 2011. But there are enough positive signs here — a vastly improved bullpen, a lineup capable of withstanding Pujols’s loss, and yes, plenty of starting pitching behind Wainwright and Carpenter — to expect something better. PECOTA says 88 wins, CAIRO says 90. Sounds about right to me. but PECOTA predicts just 86. And that was before B.J. Upton collided with Desmond Jennings earlier this month, which might knock Upton out of the Opening Day lineup. So why back Tampa Bay? As many quality starting pitching options as the Cardinals, Yankees, and Rangers might have, no team can match the Rays in that department. Before the Rays locked up Matt Moore to the kind of contract that might one day rival Evan Longoria’s for team-friendliness, there was talk that the lefty phenom might start the year in Triple-A. Granted, that would be in keeping with the Rays’ history of being ultraconservative and ultrathrifty with their top prospects. But it was also a vote of confidence to the team’s other starting options. James Shields and David Price offer one of the best righty-lefty combos in baseball at the top of the rotation; Jeremy Hellickson was last season’s Rookie of the Year; throw in Jeff Niemann, Wade Davis, and Alex Cobb, and the Rays have six other legitimate options for a championship-quality rotation, maybe even seven or eight depending on the development of Alex Torres and Chris Archer. The offense figures to improve too. The Rays opened their wallets (by Rays standards, anyway), spending more than $13 million in guaranteed money to reel in lefty sluggers Carlos Pena and Luke Scott. Evan Longoria’s numbers figure to get a big lift after injuries and a flukishly low .239 batting average on balls in play suppressed his results (especially in the first half). And while the Rays don’t have anywhere near the hitting depth that they do on the pitching side, they do have great versatility with multiposition players like Ben Zobrist and Sean Rodriguez, and a potent bat standing by at Triple-A in Brandon Guyer. The bullpen also has a chance to be the deepest in team history, with Kyle Farnsworth and Joel Peralta returning after big first seasons with the Rays and a wealth of promising young arms such as Jake McGee and Brandon Gomes primed to handle the middle innings and set-up roles. until you look up and see that the Rays have beaten one or both of those teams in three of the past four years, making the playoffs each time.